Today’s guest post is brought to you courtesy of Company Folders. With the convenience of digital marketing, many companies have forgotten how effective print marketing can be in attracting new customers and keeping existing ones. However, in order to be effective, you have to have materials that show of your brand in the best possible light while staying creative enough to entice new customers into taking notice of your brand for the first time. Using QR codes in your print marketing shows you’ve got digital savvy, and it gives customers a reason to visit your website or download your app. When smart phone users see a QR code, they can’t help but want to follow it to see where it goes. Just make sure you’re leading them somewhere that’s going to help you seal the deal. Try using designer QR codes with color to make your codes work with your design. Think about all those Super Bowl ads that get us talking around the water cooler the next day. Whether funny, poignant or just plain annoying, these commercials instigate the audience into talking, discussing and in some cases even arguing over them. Create print designs that get your audience talking, even if you have to be slightly provocative to do so. When it comes to grabbing the audience’s attention, sometimes an idea that sounds insane is the one that gets your company noticed. Nothing engages an audience quite like a story, whether it’s told through text, images or a combination of both. Decide what your company’s story is and how you want to tell it. All of the best advertising campaigns have a narrative—from the toy bunny that just keeps going, to the old ladies who want to know where the beef is. Your narrative could be a written story, a series of sequential pictures like a comic or just one bold image that says it all. In this age of social media, customer testimonials are crucial for any business. Ask some of your longtime clients and customers if they would be willing to say a few kind words about your company, and include a photo of each. Not only are you showing your potential customers how well you treat your clients, you’re enticing them with the idea that one day they might be the happy smiling face in your marketing media. Most of your existing and potential clientele probably consider themselves to be eco-conscious, and will respond positively to companies that share their ideals. Use green printing materials and encourage customers to recycle them to present your brand as an ecological ally. Green printing materials include items made from recycled paper or items printed with soy-based ink, which is biodegradable. You’ve gotten your printed materials into the hands of your potential customers—so now what? Without a call to action, recipients are going to ask themselves the same thing. Tell them exactly what you want them to do, whether that’s “call now for a free estimate” or “save a bundle with our services.” Once you’ve told them what you want them to do, follow up with your contact information so they can do so. Not every potential customer is going to heed your call to action, so you have to motivate these stubborn mules with a carrot. Add coupon codes, special offers and introductory rates on your marketing material to give them a reason to get in contact. Your clients would rather receive a hand-written letter from a friend than another piece of junk mail. When appropriate, try to reproduce that personal feeling whenever you can. Take the time to add a hand-written signature instead of using a stamp. Create media that incorporates your client’s name directly into the design. Let your customers feel like they’re the only person that matters to your company. If you’re mailing marketing materials to potential clientele then you already have their address at hand. Use it to create custom maps that show recipients exactly how to get to you. Not only is it a clever way to add a personal touch, it calls the recipient to action and provides them with the means to get there. Printed marketing isn’t all postcards, mailers and brochures—even your organizational tools can benefit from a bold design that accurately represents your brand. Customizing your folders and binders so that they look more like your marketing materials than your office supplies. Use bright colors, mission statements and interesting imagery to show off your brand in style. Some customers want to know as much as they can about a service or product before they make a commitment. 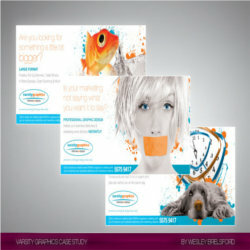 Craft a sales package using a number of different printed materials working in tandem. Create a booklet of information with a custom cover and place it inside a custom folder (along with a brochure and business card)—then mail the entire thing out in a customized portfolio envelope. Sometimes you really do have to go big or go home. Being creative and clever is important, but not as important as your brand’s message. If your design clashes with your message then it misrepresents your brand. Take a step back and look at your marketing materials—what are they saying about your company, and does that work to your advantage? Sometimes even a good idea has to be scrapped because it’s not the right message for your company. You have something important to say to your audience, so do it in a lively and dramatic way. Any business could claim that they “offer quality service at an affordable rate,” but that doesn’t sound very exciting. Instead, you could write that your company offers the “highest quality service with the lowest prices in town.” Punch up your copy so that it gets your audience to take notice. Coke is red, Apple is white and McDonald’s is golden yellow. What color is your brand, and do all of your marketing materials accurately reflect that? Remember, there’s a difference between blue, cerulean and navy— substituting one for another misrepresents your brand. When in doubt, use PMS spot printing in your materials to always have the accurate tone that represents your brand color. Stock photography is good in a pinch, but there’s nothing preventing another brand out there from using the same images as you. If you want your brand to stand out, you have to be willing to create your own high-quality photos. Not only does this give potential customers a better idea of what you offer, but the pictures themselves become part of your brand identity. Design is much more than just how something looks, it also has to do with how its shaped and how it feels. Create marketing collateral on textured stocks or add embossed design elements that pop out at the reader. A potential customer who can enjoy both the look and touch of your marketing materials will have a stronger connection to your brand. Pairing up with another brand name is a great way to attract crossover customers. For example, a local restaurant and a movie theater might create a date night promotion that gives couples a discount on their meal with a valid movie ticket stub. Customers loyal to one brand would be given an incentive to try the other. Associating yourself with another brand is like receiving an endorsement, which goes a long way towards converting customers. There’s a difference between professional looking and completely boring when it comes to business cards. Your business cards should reflect your brand, but that doesn’t mean slapping on a logo and calling it done. Add color and design elements to give your card personality. Consider rounding off the corners or adding die cut designs. When recipients look at your business cards, do they see contact information or do they see your brand in a nutshell? Promotional gift items like branded pens, jar openers and stress balls are a fun way to engage your audience—you just have to be sure you’re engaging them the right way. Tie your promo items back into your brand and use it to strengthen a message. For example, an accounting firm might hand out floating key chains with the message “we keep our clients afloat” printed on it. Word of mouth is a good way to drum up business, so you want to create a design that gets passed along to others. Referral offers are an easy way to create word of mouth publicity, but don’t underestimate the power of a creative design. Sometimes we like to share things with our friends and family just because they’re interesting, poignant or funny. Have you implemented any of these tips in the past with your own messaging materials? How’d it work for ya? Please feel free to drop your thoughts in the comments below. Company Folders believes that knowledge is power, especially when it comes to making sure your business looks its best. Our graphic artists, copywriters and print advertising specialists aim to share their knowledge and give you the edge you need to create truly memorable marketing materials. At CompanyFolders.com, quality isn't just an act--it's a culture. Follow us on Twitter to stay connected.